One of the challenges of running a blog or owning your own business is that you often end up wearing all the hats; writer, editor, photographer, accountant, designer and even janitor. It would be amazing to hire some help, but when you’re just getting started that usually isn’t possible. So bring on the DIY! A consistent brand identity is probably one of the most powerful ways that you can establish credibility and stand out among your competitors. Your brand identity includes your website, social profiles, print collateral and any other visuals related to your blog or business, like Instagram and Pinterest. Establishing a cohesive look across all of these pieces helps build trust and allows your readers or customers to easily recognize your brand, which is definitely what you want! Now you may be thinking that all sounds rather overwhelming, but it doesn’t have to be. Let’s break it down, shall we? By now you’ve probably already established a name for your blog or business and even created a logo that you love. If not, check out this post for some help with that (and some free logos). While a name isn’t going to make or break you, it is important to create a brand that communicates what you’re all about and resonates with your target audience. Remember those words you were playing with when you were trying to figure out a name? Keep referring back to those throughout this whole process. You may not even realize it, but typography is a huge part of any great design and will play an important role in all components of your brand identity. How would you describe your brand identity? Is it delicate, bold, modern, traditional, or playful? Choose one or two fonts that communicate this effectively and stick to only those two for all of your collateral pieces - website, blog posts, business cards, etc. It’s important to find fonts that work on the web; Google Fonts has a ton of quality fonts that you can use (for free) on both desktop programs like Photoshop and online platforms like WordPress or Squarespace. Some of my favorites are Montserrat, Playfair Display and Oswald. Creative Market is another awesome resource for finding unique fonts from independent designers. It’s amazing how a few choice colors can communicate a feeling without any words at all. Colors are powerful and are important to consider when nailing down your brand identity. Most people have a couple colors that they are naturally drawn to, but don’t stop there. Consider colors other than your favorites that might better convey your brand’s mood, message and products. Are you a blogger who sells workshops that help motivate and empower women in business? One or two deep, bold colors would better communicate what you’re all about than delicate pastels, don’t you think? Design Seeds is a great resource for finding the perfect color palette for your blog or business, as well as Coolors. The photography that you choose for your website and social profiles sets the tone for your blog and communicates your style effortlessly. But where to start? Finding or taking consistent, quality photos that will make people think wow, this girl is legit might just be the hardest part of this whole process. Have a DSLR camera lying around that you fully intended on using? Now is your chance! Bust it out and maybe enlist a friend to help you take some candids of yourself. If photography simply isn’t your thing, there are a ton of places online where you can pick up some sweet, pinnable imagery. My favorite is Unsplash as the library is huge and their do whatever you want license is pretty epic. Now you’ll realize where we get so many of our images… the secret’s out! We also recently launched our mockup toolkit for Photoshop that allows you to effortlessly create eye-catching blog headers, website landing images and everything in between without tearing apart your whole apartment. Now this one may not have to do with the visuals of your brand, but it’s important nonetheless. The language that you use should be consistent with all those things we went over above. If you’re using lots of color and playful typography, a casual, friendly writing style will be better suited than a serious, authoritative tone. Remember that it’s best to stay true to yourself and write naturally, like you’re talking to a close friend. 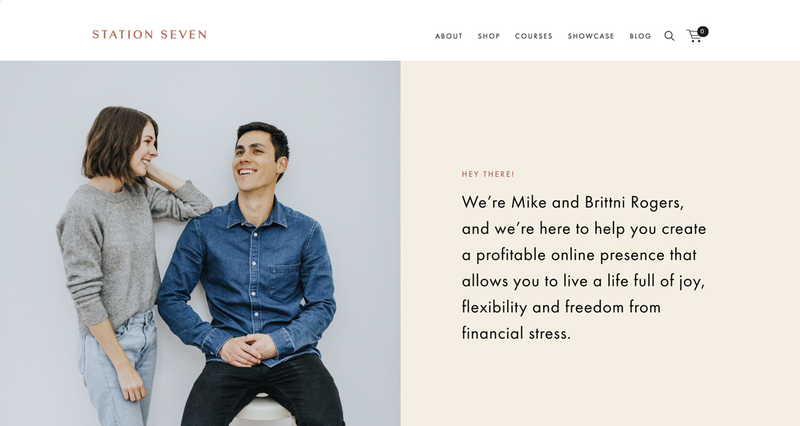 There’s a good chance that the typography, colors and photography that you chose are pretty consistent with who you are and your style and your tone of voice should complement these pieces nicely. 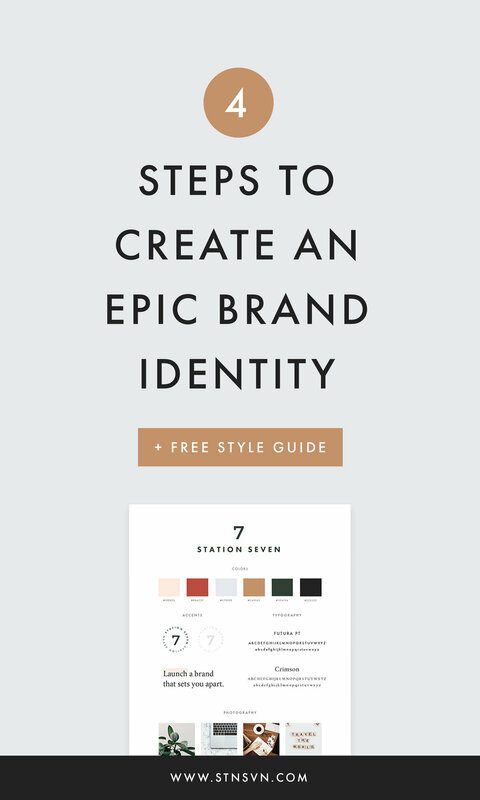 To help you bring all of these different elements together and create a stunning, cohesive brand identity we’ve included a style guide below (and it’s totally free)! Show off your new look on Pinterest and give your readers a sweet visual when announcing your rebrand - they’re sure to be impressed, as they should be! What does your brand identity communicate? Are you using big bold colors, or soft delicate pastels? Share your ideas in the comments below, plus links to your complete style guide - I’d love to check it out! P.S. 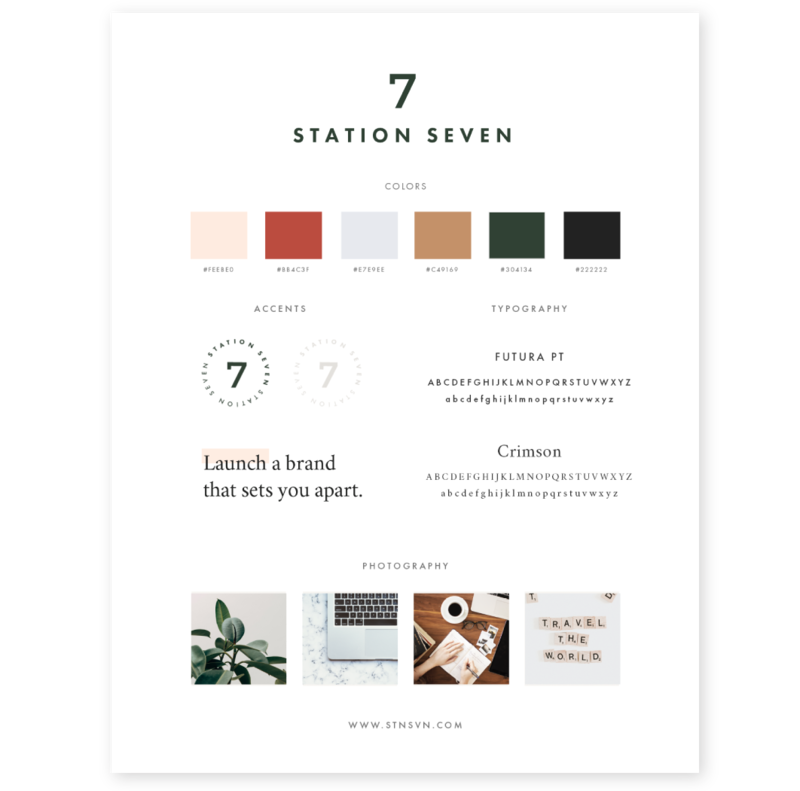 If you're looking to show off your brand online, check out our themes + design kits!